CEDAR CITY — Cedar City Council voted Wednesday to approve a 2016 budget that grants a three-part raise to city employees. The raise will bring salaries closer to the minimum of what a 2015 salary study showed employees should be earning, Finance Director Jason Norris said. The study was commissioned by City Council and administrators after multiple employees expressed dissatisfaction in their salaries in 2014, stating they could earn more in other communities for the same job. Since then, several employees have left for higher paying positions elsewhere. 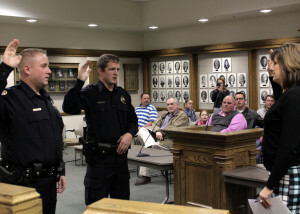 In fact, two new police officers who were hired to replace officers who left to pursue a more competitive pay wage in northern Utah were sworn in at Wednesday night’s meeting. “These are good officers we’re losing too,” patrol Lt. Keith Millett said before the City Council meeting began. Millet has been on the Cedar City Police force for 26 years. A lot of time and expense goes into training these officers, Norris said. To lose them to another community, because Cedar City could not afford to pay them the minimum of what they could earn elsewhere is a travesty, Norris said. We have the law enforcement agencies up north recruiting away our officers. We have officers that should be 10 years into the pay scale and some of them are only two years into the pay scale. Then they transfer up north and they will pay them for all 10 years. One of the officers who left with nearly 10 years of experience, Norris said, acquired close to a 30 percent pay raise by relocating. City employees have had very small raises or no raises at all for about seven years, he said. When the economy took a nosedive years ago, he said, the city could not afford to give raises and continue to function at the level required to meet basic community needs. The compensation study was conducted by Personnel Systems and Services, 1325 West Bluemont Drive, Salt Lake City. When the study was complete, Owner Mike Swallow said, the city indicated to him that they would have to roll pay increases out in waves because it was too big of a chunk to bite off all in one sitting. Cedar City currently employs 151 people, Norris said, 62 of them were below the minimum range of salary expectations based on Swallow’s research. The plan to raise wages that was approved in the 2016 city budget will roll out a 2 percent raise to all city employees. In addition, $50,000 has been allocated to the Cedar City Police Department to be split amongst all 35 employees evenly, Norris said. The third component of the 2016 city employee raises will address the 62 employees indicated by the study that were being paid under the minimum of what compensation expectations should be. Each of them will receive an individual raise, Norris said. The raise is structured to take what they are being paid currently and the minimum amount of what they should be compensated and raise their salary to the midpoint between the two numbers. Between the 2 percent increase and the individual raises, he said, city administration hopes to have employees compensated at a rate that is much closer to the minimum target salaries. It took some wiggling to make the numbers work, Norris said, but thanks to an audit of the 2014 fiscal year that showed fund balance needs are being met and an increase in revenue the wage increases were possible. wonderful mormon city officials voting themselves raises. anyone surprised? TRUMP FOR PRESIDENT!!! paying cheap wages is a mormon cultural thing. any lds care to weigh in? Okay, THAT much is true, since Brigham Young “strongly suggested” that brick masons and carpenters should be willing to accept 50% cuts in pay to move from the east to Deseret. Interesting how tough it is to break a generations-old tradition of slave labor and minimum wage.